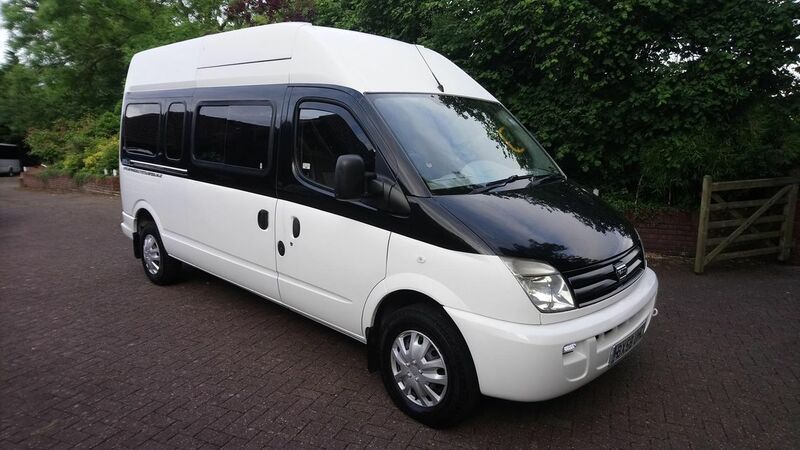 Newton Abbot Limo Hire in Newton Abbot, has a range of cars available for hire amongst our impressive fleet, including wedding cars, party buses, and stretch limousines. 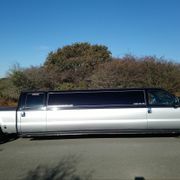 Also Available for Airport Transfers, Proms etc. Our White 300c (Baby Bentley) is a stunning car. 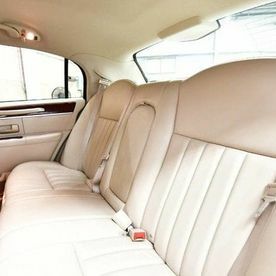 It has the full Bentley Pack and is in a very unusual Ice White colour, with just a little sparkle under the sunlight. 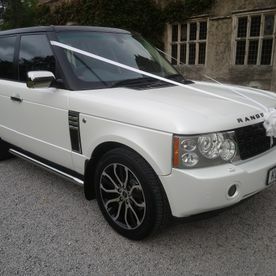 At Newton Abbot Limo Hire we have had this enhancement especially for Weddings to just be different from an average car. It’s your special day so you need a special car too. The car also has lots of gleaming chrome and full chrome wheels just to add a bit more sparkle. This wedding car is by far the most popular with our brides as you ride in absolute luxury, looking out from behind blacked-out windows. Want to feel like a celebrity, then this is the one! 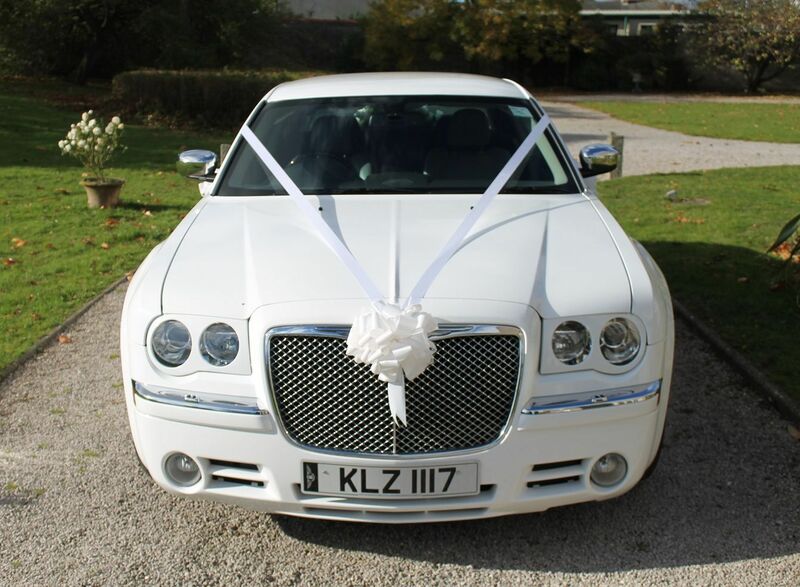 The Baby Bentley also looks fantastic with any of our other wedding cars or limousines if you need extra transport for maybe the Bridesmaids. 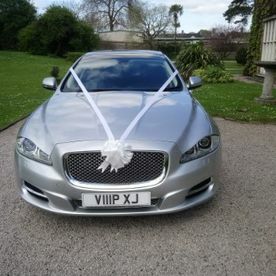 With every wedding booking we supply full ribbons including door handles in the colour of your choice, we also put out a red carpet just to make it all a bit more special for your day and all chauffeurs are fully suited. 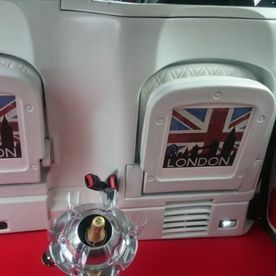 The Baby Bentley is also fully Private Hire Licensed so can also be used for a trip to the Airport, a school prom or anniversary basically for anything you require. Our Black 300c (Baby Bentley) is a stunning car. 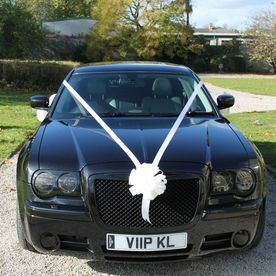 It has the full Bentley Pack and is in a very unusual Gloss Black colour, with just a little sparkle under the sunlight, At Newton Abbot Limo Hire we have had this enhancement especially for Weddings to just be different from an average car. It’s your special day so you need a special car too. The car also has lots of gleaming chrome and full chrome wheels just to add a bit more sparkle. 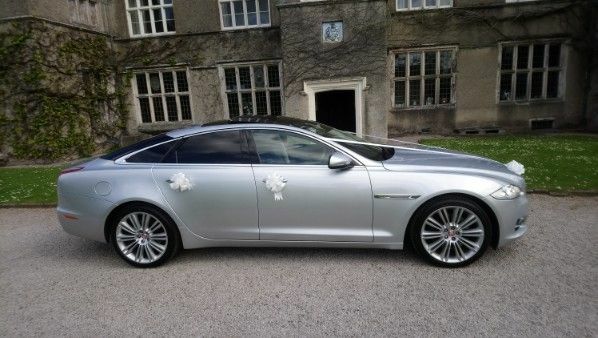 Our Silver Jaguar XJ Luxury is the flagship of the Jaguar range. 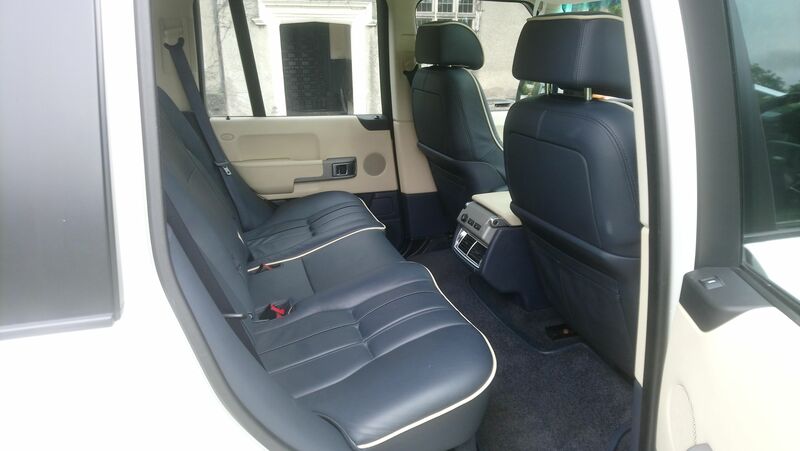 This XJ Luxury is far superior to the XF model and has much more room inside, allowing you to travel in absolute comfort. 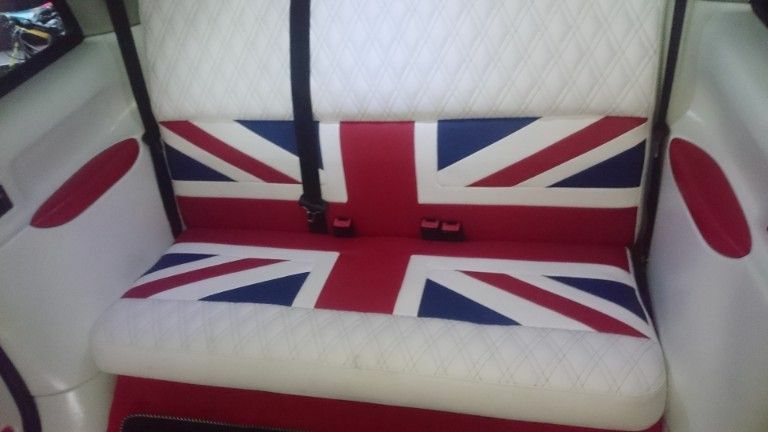 Your special day needs a special car! The car also has lots of gleaming chrome to add a bit more sparkle. This wedding car is by far the most popular with our brides you ride in absolute luxury looking out from behind blacked out windows. Want to feel like a celebrity, then this is the one! 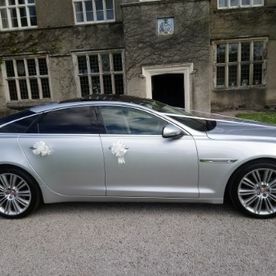 The Jaguar XJ Luxury also looks fantastic with any of our other wedding cars or Limousines if you need extra transport for maybe the Bridesmaids. 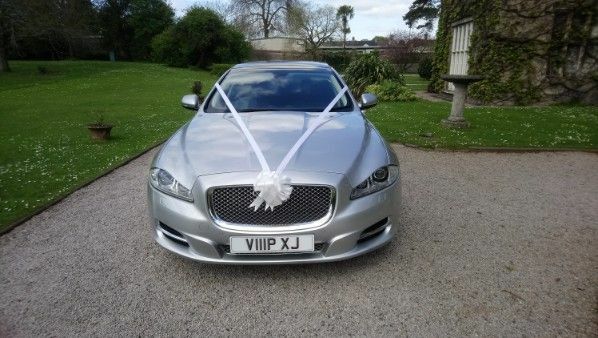 The Jaguar XJ Luxury is also fully Private Hire Licensed so can also be used for a trip to the Airport, a school prom or anniversary basically for anything you require. 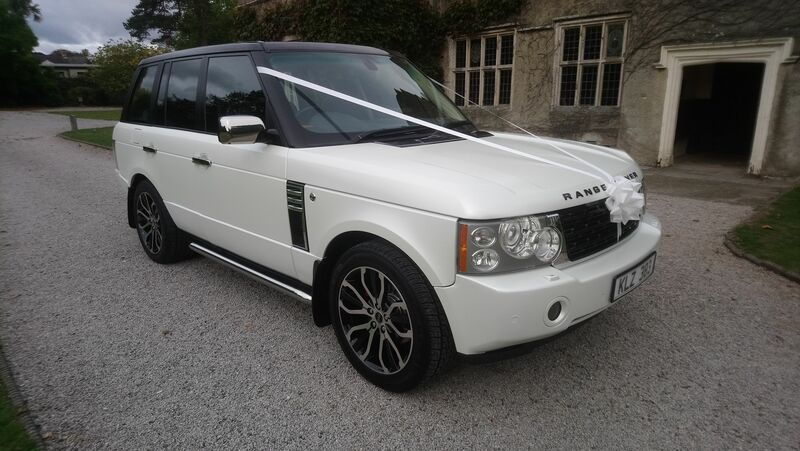 Our Bespoke Range Rover Vogue Autobiography has a stunning Satin Pearl White exterior with a Gloss Black roof. 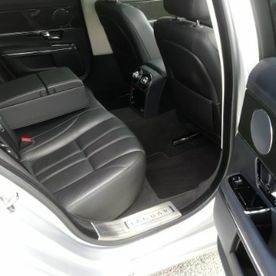 This is a one-off colour and only available at Newton Abbot Limo Hire, with its lavish leather and wood interior you feel like you are in another world. 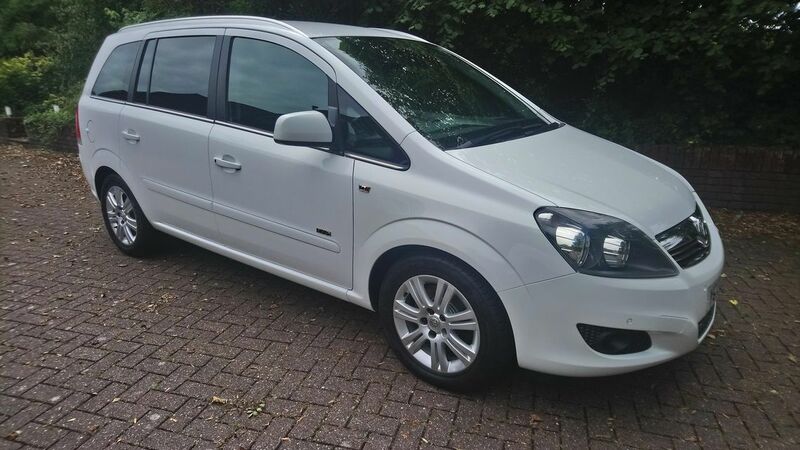 Being the full-size vogue model there is plenty of room inside allowing you to travel in absolute comfort, don’t get confused with the lesser sport model this is the full deal. It’s your special day so you need a special Car too. The car also has lots of gleaming chrome to add a bit more sparkle. 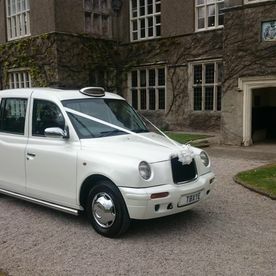 This Wedding car is new to our fleet and has become very popular with our brides with its fantastic one-off colour, you ride in absolute luxury looking out from behind blacked out windows. Want to feel like a celebrity, then this is the one! 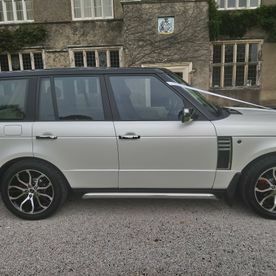 The Range Rover also looks fantastic with any of our other wedding cars or Limousines if you need extra transport for maybe the Bridesmaids. 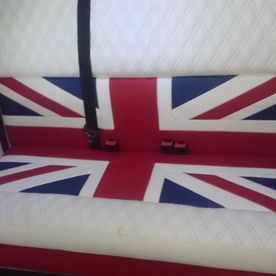 The millennium style London Taxi wedding car has wide rear doors which allows easy access into the wedding car, where you will find the interior finished in traditional London themed white leather. 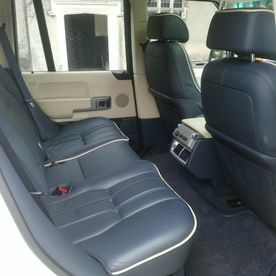 Extra seating is available with the drop-down seats located behind the driver, allowing the Imperial to accommodate up to 5 passengers in comfort and style on your special day. The London Taxi classic wedding car is finished off in a beautiful Pearl white along with chrome accessories just to finish it off. 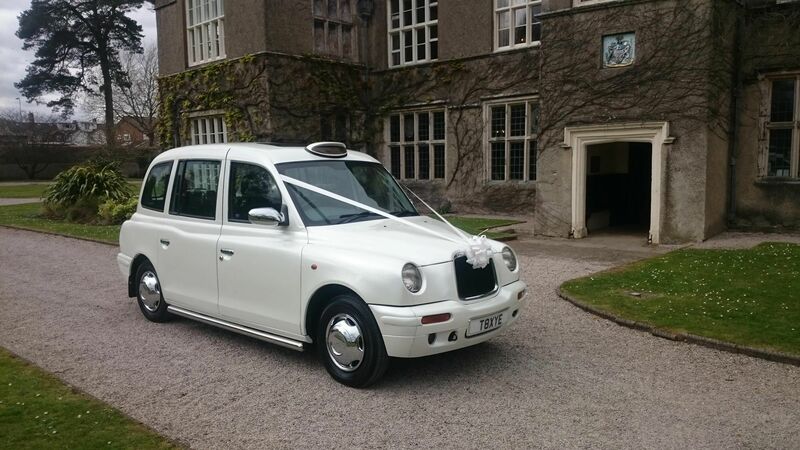 This beautiful wedding car can be booked individually, or alongside any of our limousines or Wedding cars. 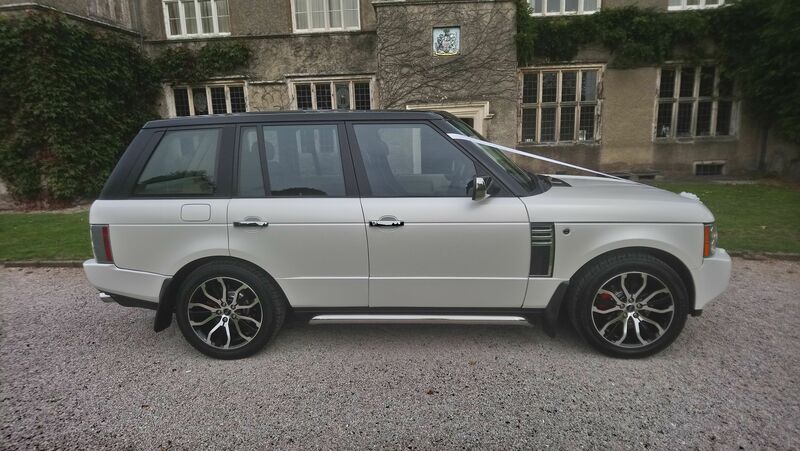 Viewing is highly recommended to appreciate the true quality of this beautiful and spacious one-off wedding car this vehicle is exclusive to Newton Abbot Limo Hire and you will not find another one the same. 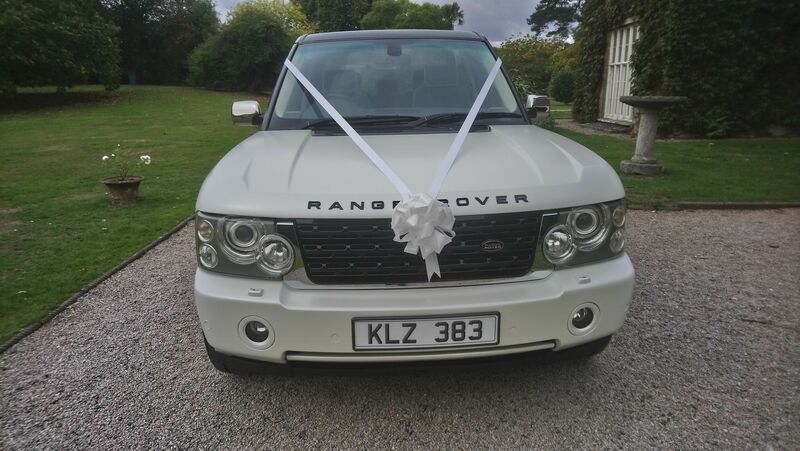 This vehicle is also fully private hire licensed to enable it to be used for many other occasion such as School Proms, Anniversary’s and much more. 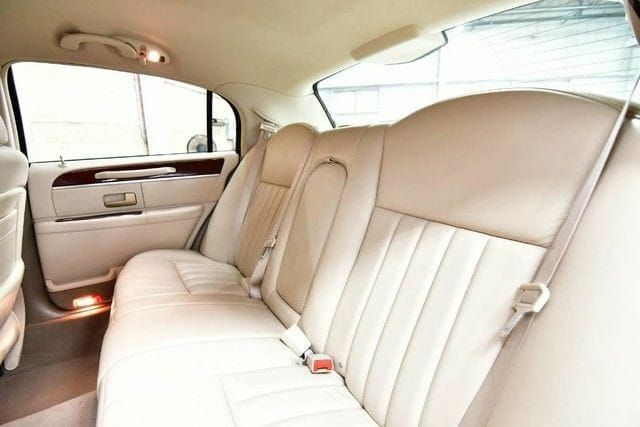 Our White Lincoln Towncar is a stunning, very rare car. We specially ordered this vehicle from the USA to match exactly with our 8 seater White Crush Limousine, and they look fantastic together. 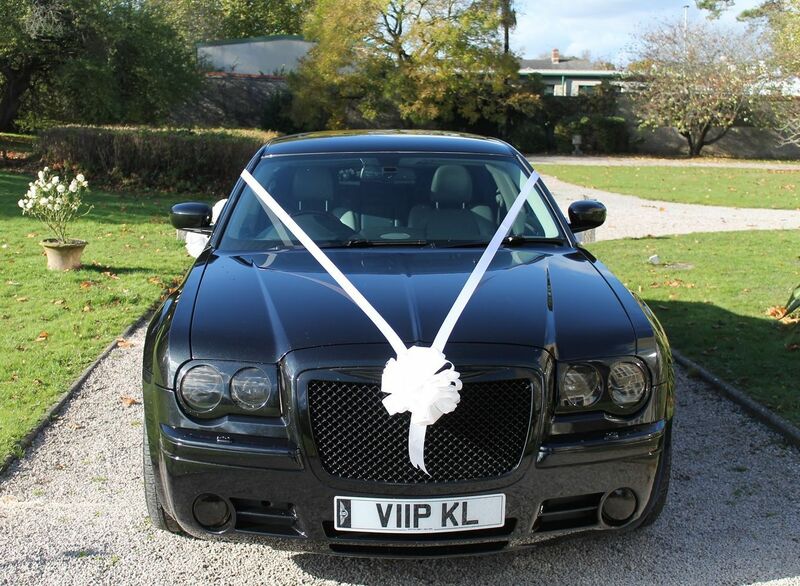 Bride in the car and bridesmaids in the Limousine at Newton Abbot Limo Hire. 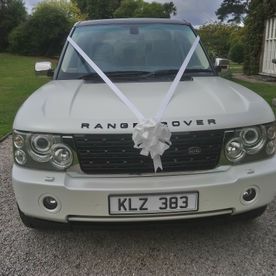 We have had this enhancement especially for weddings to be different from an average car, it’s your special day so you need a special car too. The car also has lots of gleaming chrome and full chrome wheels, just to add a bit more sparkle. 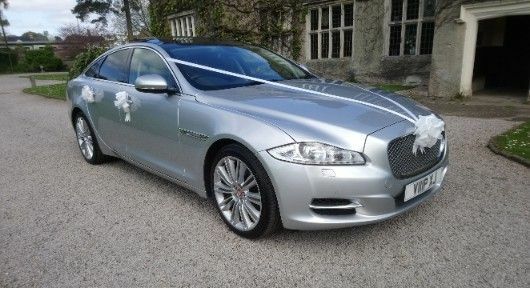 This wedding car is also popular with our brides, you ride in absolute luxury with its cream leather seats with full comfort pack. The Lincoln Towncar also looks fantastic with any of our other wedding cars or Limousines if you need extra transport for maybe the Bridesmaids. 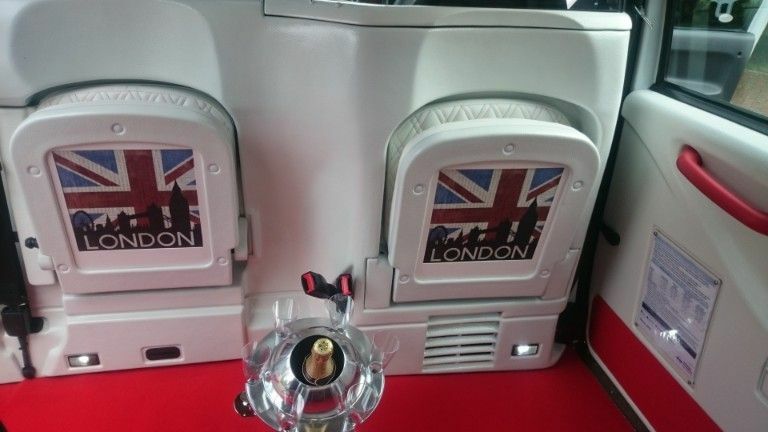 Our White Crush Limo seats up to 8 passengers and is also one of a kind, exclusive to us here at Newton Abbot Limo Hire. 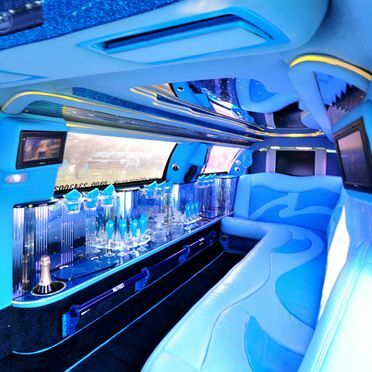 The White Crush Limo is very different from your average limo it has a two-tone baby blue interior with glitter bar areas and even has glitter carpet. 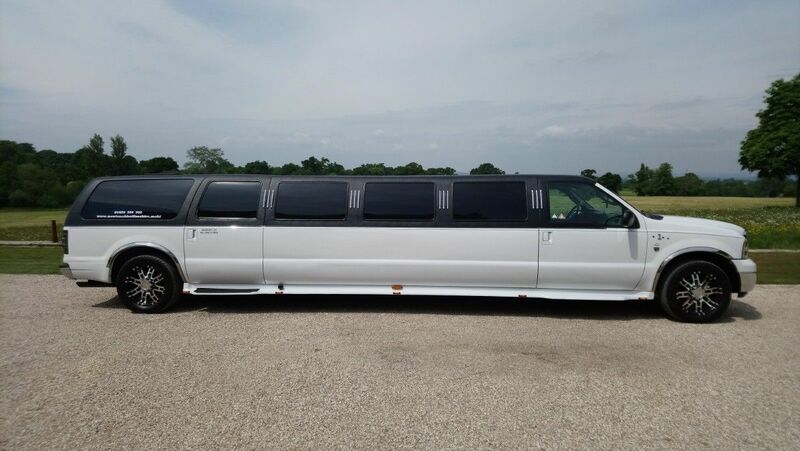 This limo is unique also with its factory raised roof which gives more headroom than an average limo, with a variety of different features and accessories to offer we can assure you that you will not be disappointed. 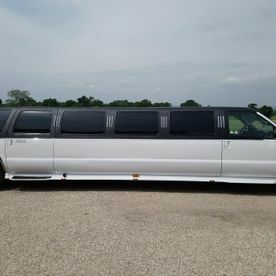 This Limo is a little subtler looking than the Hummer style limos as it is the Lincoln Town Car, a very popular all round limo. 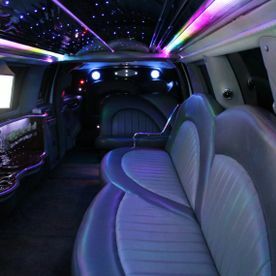 Inside is another world of excitement, with colour changing fibre optics, neon’s, strobes and champagne bars, this is your very own club on wheels. Get your celebrations started early by traveling to your destination in style! 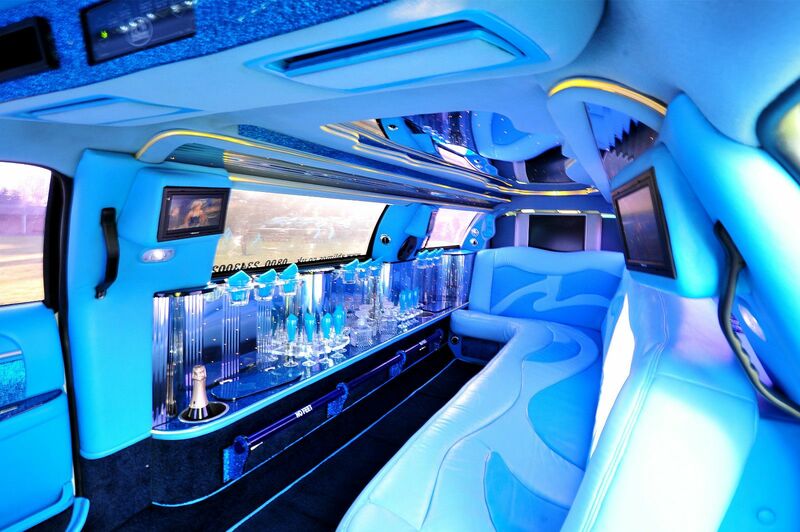 This limo allows you to have fun in private, behind blacked out windows. Want to feel like a celebrity, then this is the one! 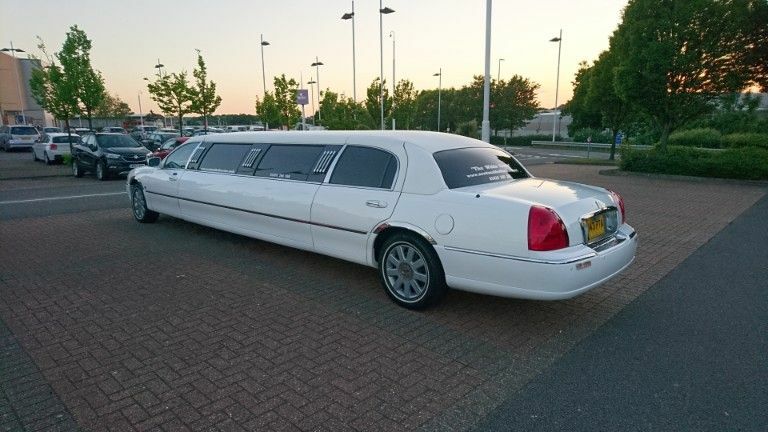 This Limousine is a perfect choice for a number of different events such as Royal Ascot, Cheltenham races, Newbury races, anniversaries, nights out, sporting events, proms, weddings, birthdays and many more. 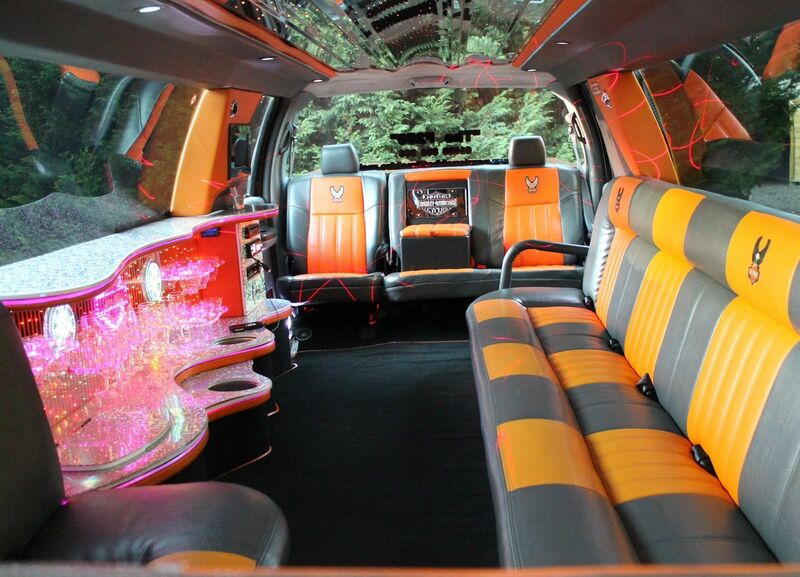 Its’ simple yet extravagant style makes it the perfect limousine for any event or occasion. 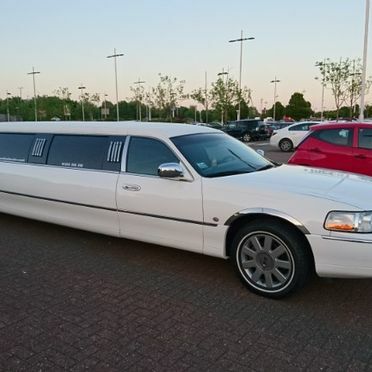 Newton Abbot Limo Hire covers all areas in and around the South West such as Plymouth, Exeter, Torquay, Taunton. We also operate and are able to visit places further afield, some of our most popular destinations have been to bigger cities such as Birmingham, Cardiff, Bristol, London, Bournemouth, Cheltenham, Reading, Swindon and many more. 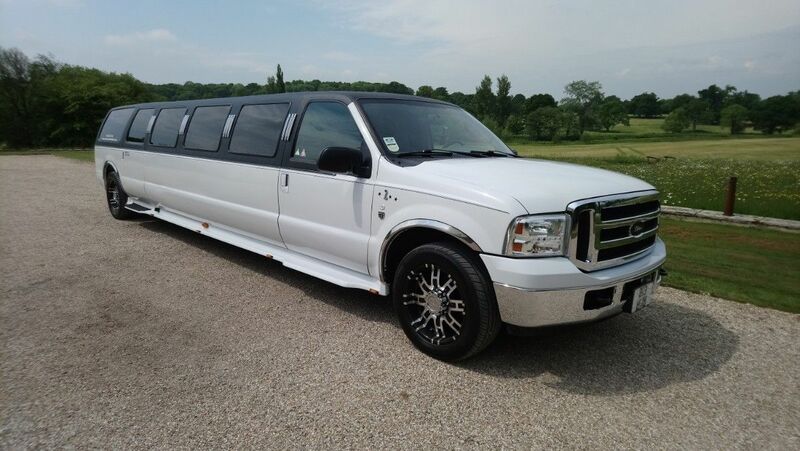 Our Black and Silver F250 Harley Limo seats up to 8 passengers and is a one of a kind, exclusive to us here at Newton Abbot Limo Hire. This is the only one of its kind in the whole of the UK. When you see it, you cannot deny that it is a beast of a hummer. 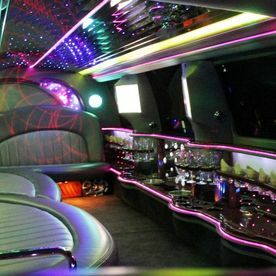 This special Hummer style limo is unique to the eye both inside and out, with a variety of different features and accessories to offer we can assure you that you will not be disappointed. If you are looking for something unique, classy and magnificent then here it is! 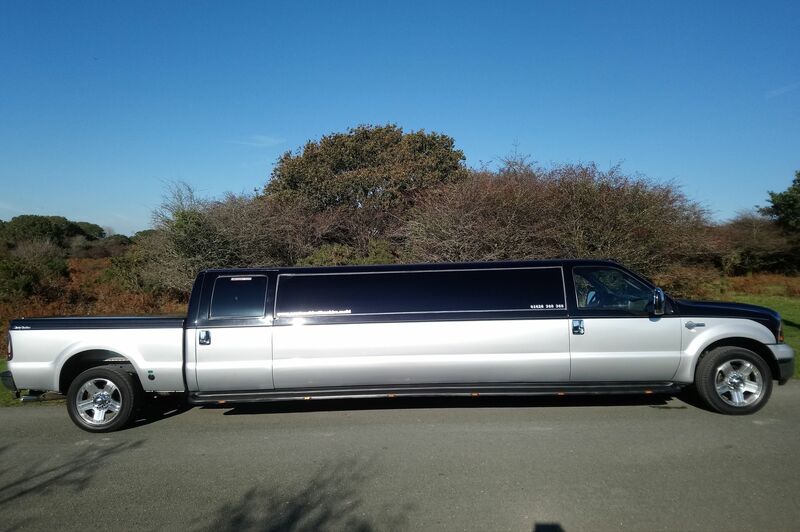 This Limousine will without a doubt stand out from the crowd, as this particular Limo is so big and unique looking, you will find nothing else like it. You are sure to turn heads and see jaws dropping when you arrive at your destination. 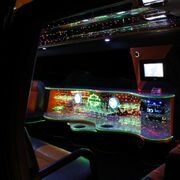 Inside is another world of excitement, with colour changing fibre optics, neon’s, strobes and champagne bars, this is your very own club on wheels. Get your celebrations started early by traveling to your destination in style! This hummer allows you not only to become the centre of attention but to also to have fun in private, behind blacked out windows. Want to feel like a celebrity, then this is the one! 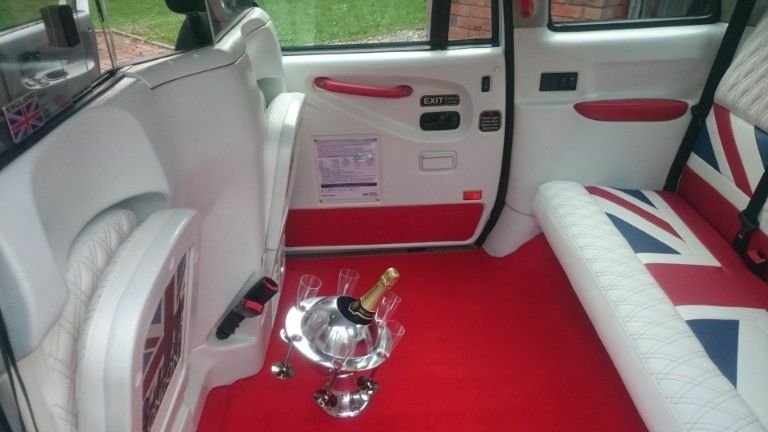 This Limousine Hummer is a perfect choice for a number of different events such as Royal Ascot, Cheltenham races, Newbury races, anniversaries, nights out, sporting events, proms, weddings, birthdays and many more. 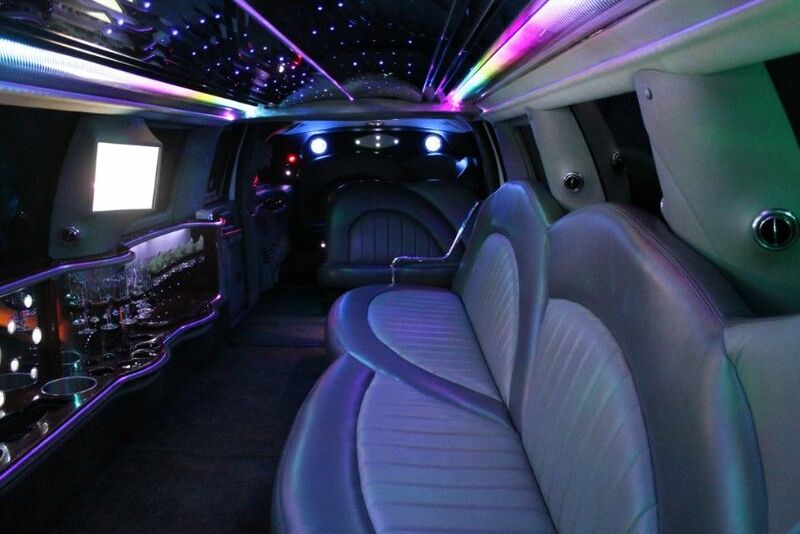 Its’ simple yet extravagant style makes it the perfect limousine for any event or occasion. 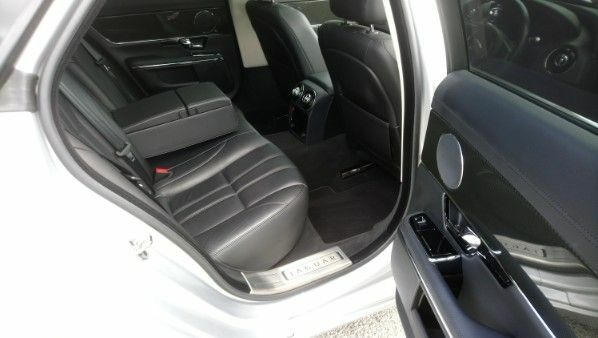 Newton Abbot Limo Hire covers all areas in and around the South West such as Plymouth, Exeter, Torquay, Taunton. We also operate and are able to visit places further afield, some of our most popular destinations have been to bigger cities such as Birmingham, Cardiff, Bristol, London, Bournemouth, Cheltenham, Reading, Swindon and many more. 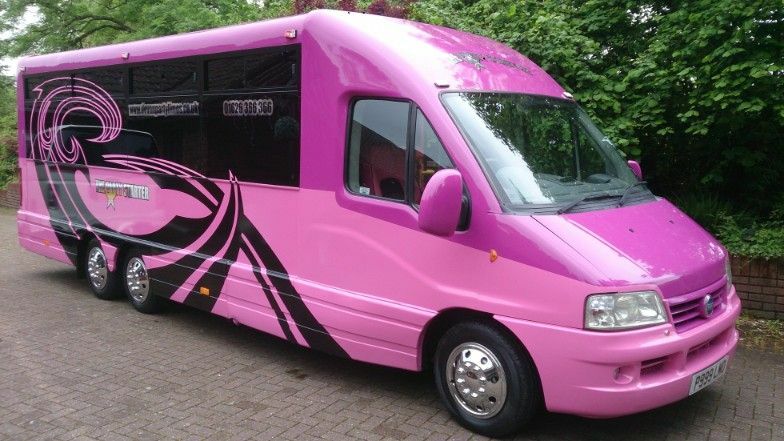 Our Pink Party Bus seats up to 8 passengers and is by far one of the most popular vehicles in our fleet. 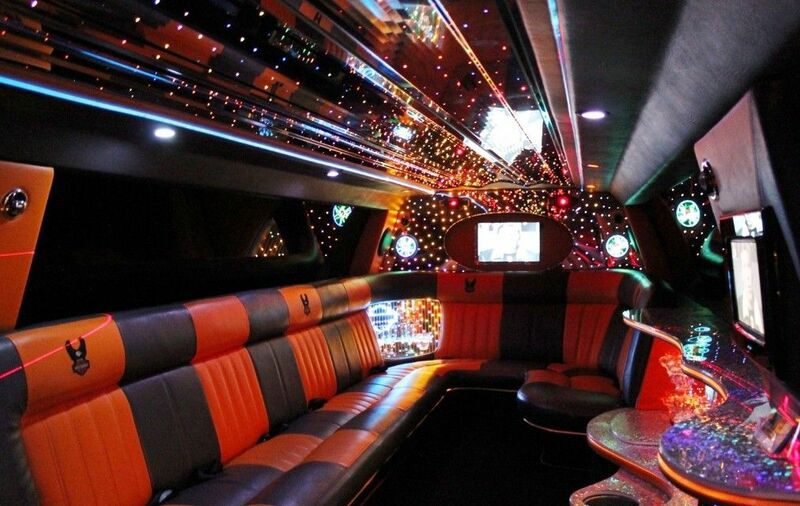 This particular vehicle is best known as a party on wheels as it provides an amazing and unforgettable party experience. 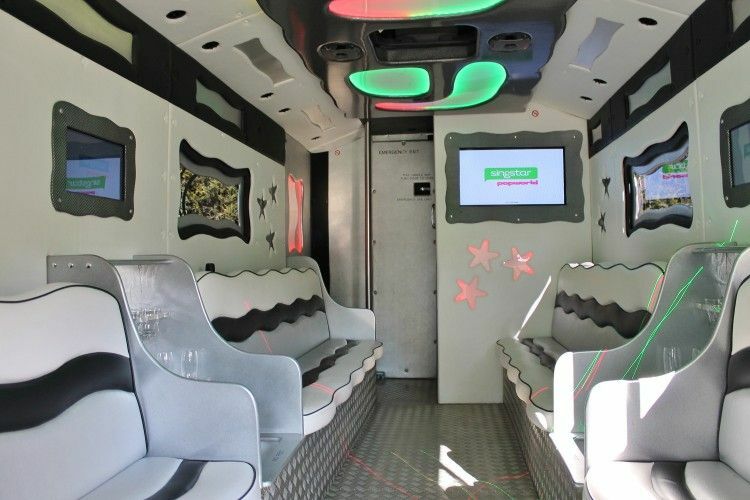 The Party Bus comes equipped with an endless list of karaoke songs, laser lights, plasma screens displaying music videos, disco bars and ceilings, champagne bars and much more! With all of this on board and much more you will not be disappointed. 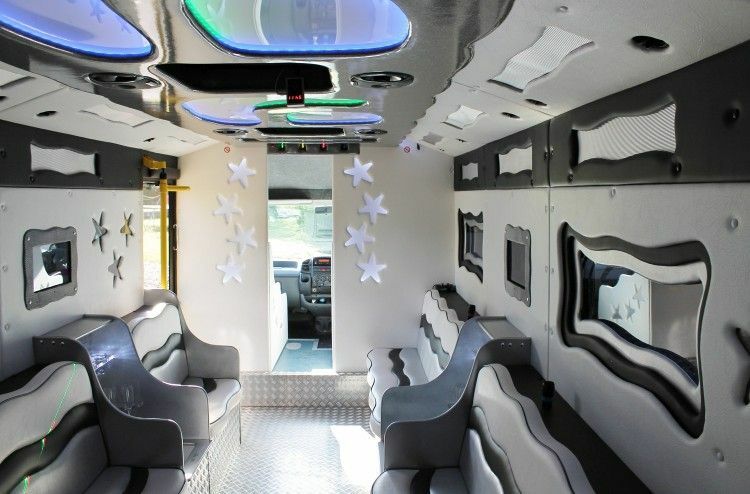 This Party Bus is set with some of the best sound and lighting systems making it a great choice for large parties who are looking for a fun and unforgettable time. 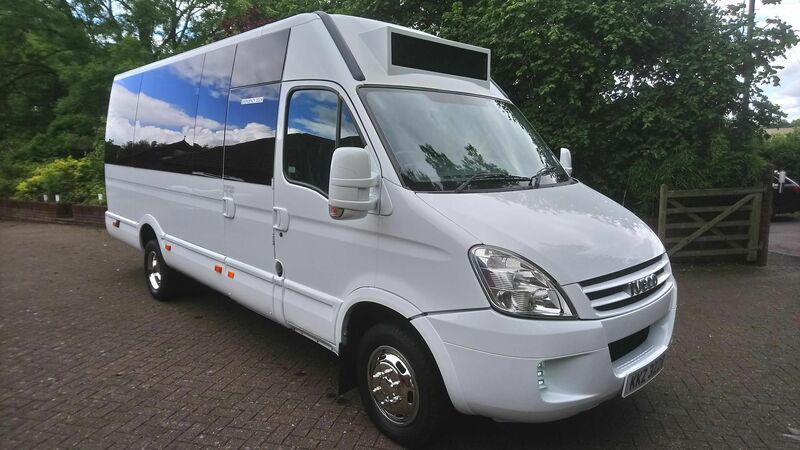 This, alongside our White and Black 16 seat Partybus is one of our most flamboyant vehicles; it is thus perfect for any party that is looking to have a fun and wild time. 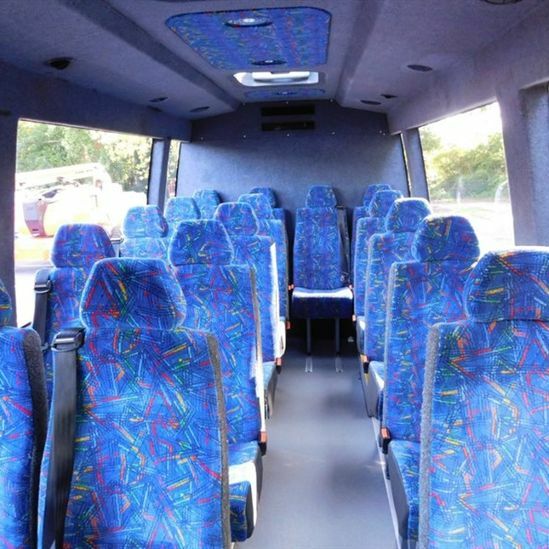 With its fun and exciting style, this party bus has been mostly used for events such as spontaneous nights outs, hen/stag dos, birthdays, weekend trips away, kids’ parties and many more. 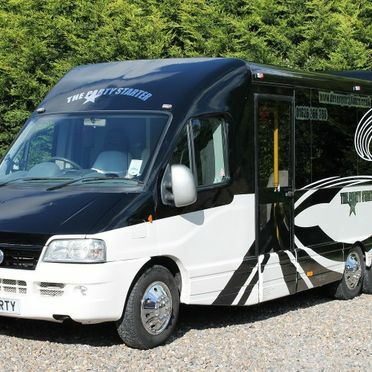 This ‘party on wheels’ is the perfect choice for any group who are looking to have a fun time, with lots of room on board it is a comfortable alternative to being crammed onto public transport. Fill out our quick online quote form and one of our members of staff will get back to you ASAP. If you wish to speak with one of our team directly, do not hesitate to contact us on 01626 366366. 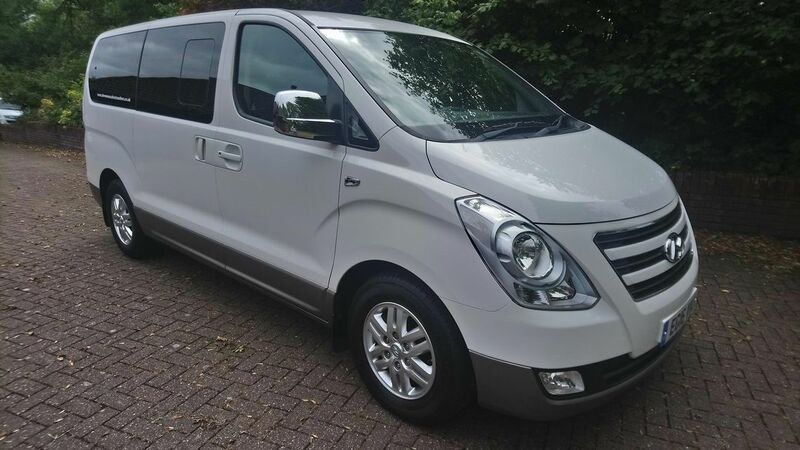 Don’t leave it too late, as this vehicle is on demand it is best to book early to avoid disappointment! 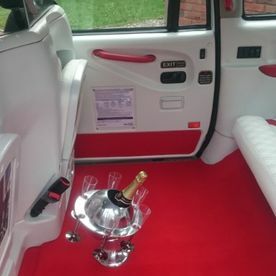 Our white Extreme hummer style limousine seats up to 13 people and is a perfect choice for any large party, especially groups of bridesmaids and wedding families that wish to travel together on your wedding day in the South west. 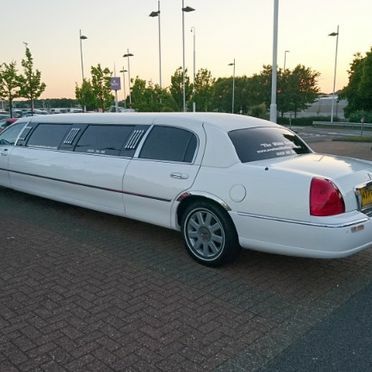 This vehicle has in the past proven to be one of our most popular limousines, spending most of its time at sophisticated and classy events such as weddings, anniversaries, proms, graduations, award ceremonies and many more. 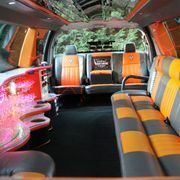 Our white Extreme hummer style limousine’s interior is a very classy executive coach build that oozes sophistication and makes for a perfect wedding car. 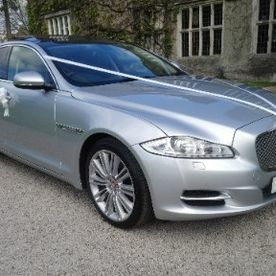 It’s gorgeous exterior and interior make it an excellent limousine for photo opportunities on your special day. Not only is it a popular choice for weddings, it is also a very popular choice for ascot races, nights outs, birthday celebrations and any sort of event that requires sophistication and class. 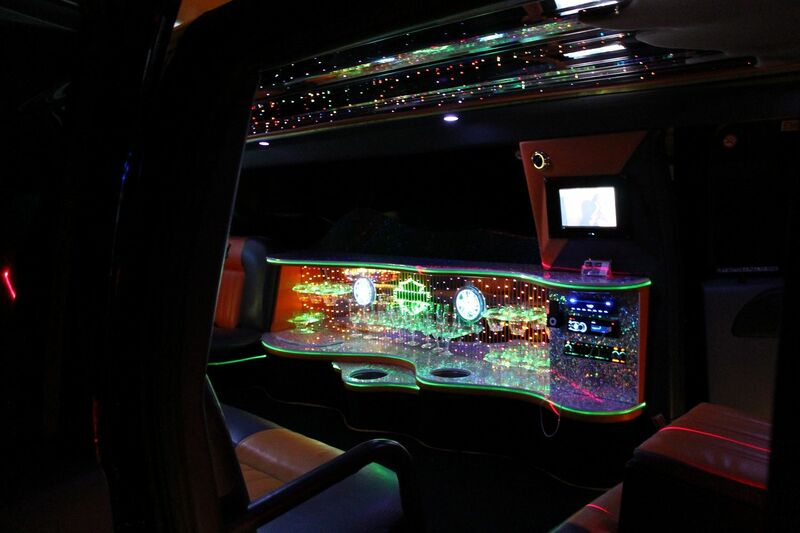 As this particular limousine offers a very chic and unique experience, it is suitable for any type of event. 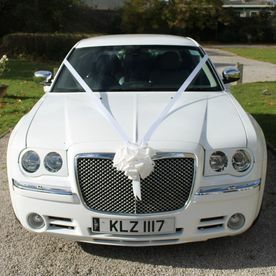 This white limousine is a favourite choice, with a VIP edge. 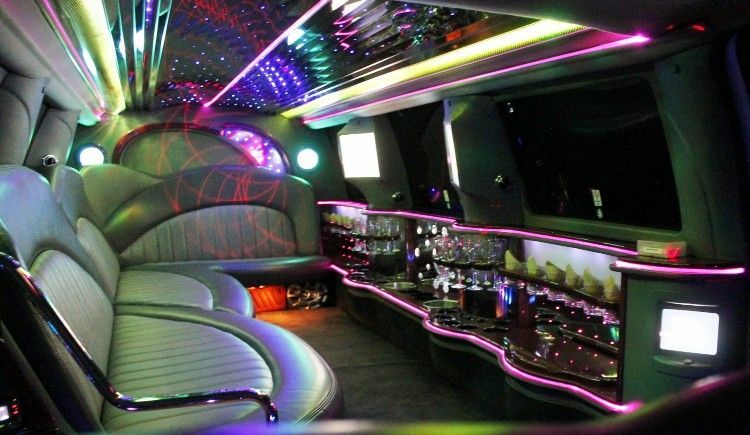 With a stargazing ceiling, color changing fibre optics, a rose wood champagne bar and its very own VIP area with a bar, this limousine is a catch! 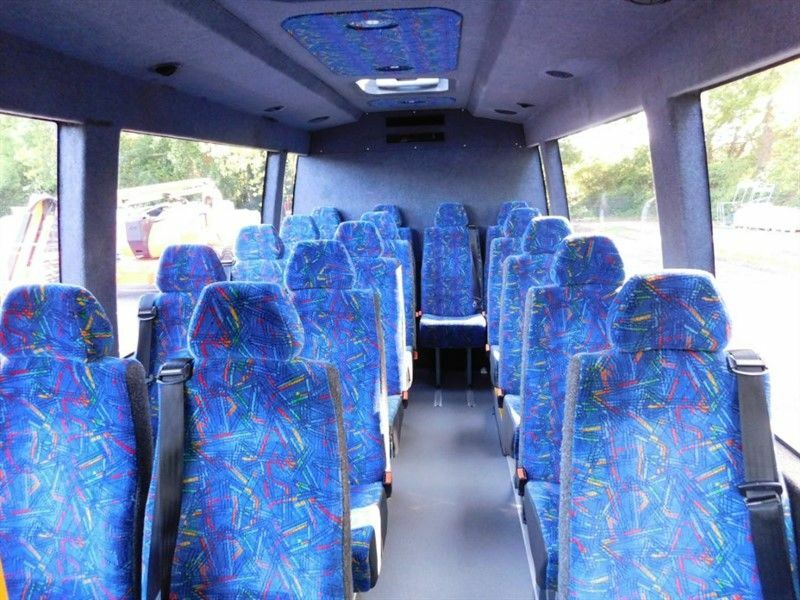 Seating up to 13 people it is a great choice for any large party looking to have a good time and a stress-free travel experience. 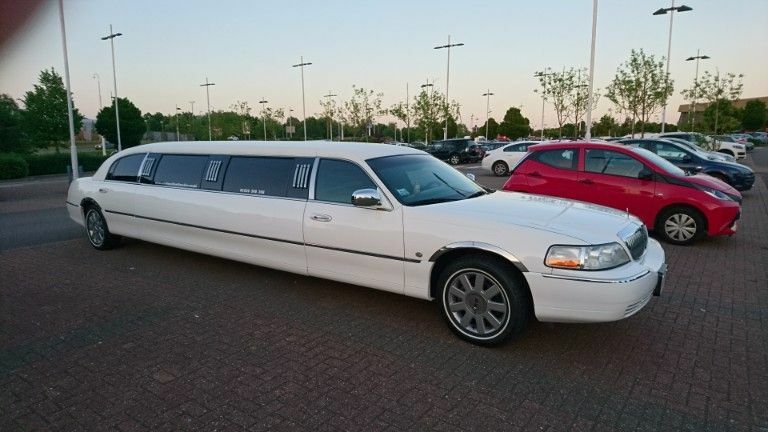 Here at Newton Abbot Limo Hire we are able to cater to your needs, by tailor making you your very own hire package we are able to provide you with the best experience, whether that requires extra drop offs, pickups, pit stops etc we can make your time with us one to remember. When for wedding packages you also get bows and ribbons in your very own colour scheme. To get a quotation today fill out our quick online quote form and one of our members of staff will get back to you ASAP. If you wish to speak with one of our team directly, do not hesitate to contact us on 01626 366366 and a friendly member of our team will answer any questions or queries you may have. 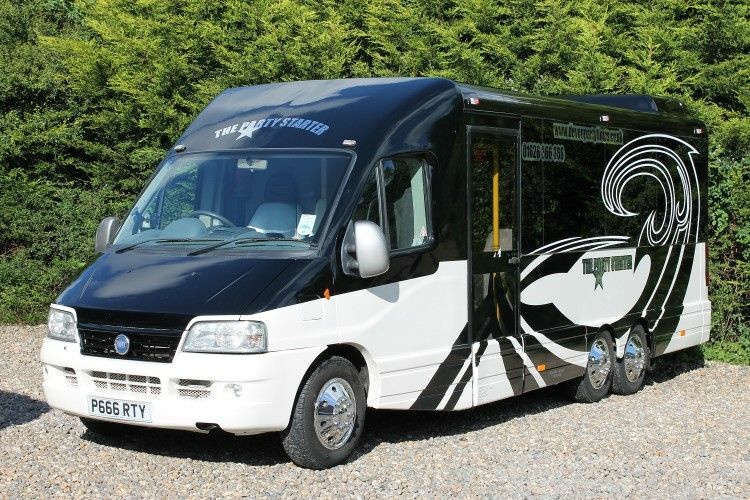 Our White and Black Party Bus seats up to 16 passengers and is by far one of the most popular vehicles in our fleet. 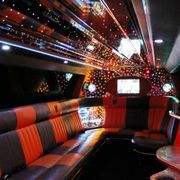 This particular vehicle is best known as a party on wheels as it provides an amazing and unforgettable party experience. 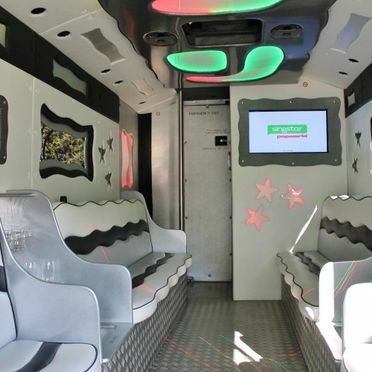 The Party Bus comes equipped with an endless list of karaoke songs, laser lights, plasma screens displaying music videos, disco bars and ceilings, champagne bars and much more! With all of this on board and much more you will not be disappointed. 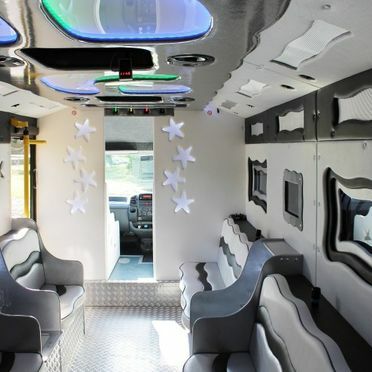 This Party Bus is set with some of the best sound and lighting systems making it a great choice for large parties who are looking for a fun and unforgettable time. 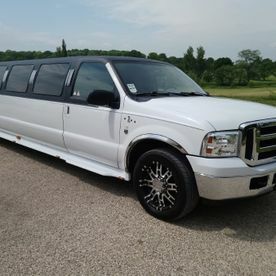 This, alongside our 8 Seat Pink Party bus is one of our most flamboyant vehicles; it is thus perfect for any party that is looking to have a fun and wild time. 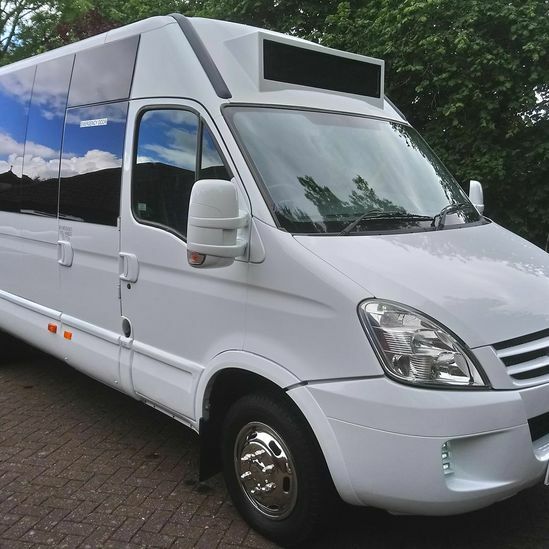 With its fun and exciting style, this party bus has been mostly used for events such as spontaneous nights outs, hen/stag dos, birthdays, weekend trips away, kid’s parties and many more. Call us today in Newton Abbot, for more information on our party buses and wedding cars.